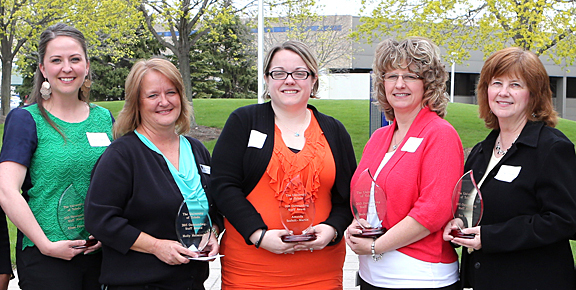 Five employees received the University’s 2015 Outstanding Staff Awards last week. Some 30 nominees were honored at a ceremony in the Radisson Birch Room. Taking home Outstanding Staff Awards last week were, from left, Elissa Falcone, Holly Helminski, Amanda Seabolt-Martin, Becky Roberts and Suzanne Martin. Elissa Falcone, graduation services specialist in the College of Graduate Studies. She has worked at the University for four years. She received a bachelor’s degree in business administration and a master of business administration degree from UT. Holly Helminski, administrative assistant in the Department of Pharmacology in the College of Pharmacy and Pharmaceutical Sciences. She has worked at UT since 1996. Suzanne Martin, secretary in the Department of School of Psychology, Higher Education and Counselor Education. She began her career at the University in 1973. Becky Roberts, senior continuing medical education coordinator in the Center for Continuing Medical Education. She has worked at the center 12 years and at the University 25 years. “Becky treats each person inside and outside the University with respect and dignity. She promotes honest communications, ethical behavior, and is accountable to the University. Amanda Seabolt-Martin, assistant director for medical student advising services and programs on Health Science Campus. She has worked in this position since 2013 and at the University since 2010. This entry was posted on Thursday, May 7th, 2015 at 3:46 am and is filed under News, UToday .